This ASCD Study Guide is designed to enhance your understanding and application of the information contained in School Culture Rewired: How to Define, Assess, and Transform It, an ASCD book written by Steve Gruenert and Todd Whitaker and published in January 2015. Most of the questions contained in this study guide are ones you can think about on your own, but you might consider pairing with a colleague or forming a study group with others who have read (or are reading) School Culture Rewired: How to Define, Assess, and Transform It. What ideas best illustrate the concept of school culture for you? What ideas are not representative of school culture? Why is the study of school culture important? Is there a connection between school culture and student performance? What purposes does a culture serve? What would cause people to confuse the two concepts of culture and climate? What does "normal" look like at your school? Is there someone who fits this profile best (i.e., a cultural role model)? What does the climate tell us? What does it not tell us? What subcultures exist in your school? Which ones have the largest membership? To which ones do you belong? Is the development of subcultures a negative response to the parent culture? Can a school's mission statement become a mission question? What does your community need the most (now and 20 years from now)? Is that need reflected in your mission? Why or why not? If a competing school were built down the road, what would it use as selling points? Does your school do the same? Why or why not? Is your school's vision statement intriguing? Is the mission statement magnetic? What would your school's "history" statement be? What would your school look like if being wrong were a less threatening proposition? Chapter 4. What Type of Culture Do You Want? Has your school ever had a culture like the one you want? Are you restricted to one type of culture? What are the rewards in a toxic culture? Do collaborative schools still have problems? Chapter 5. What Type of Culture Do You Have? What should you be thankful for at your school? Who is responsible for your school's current culture? What metaphor best describes your school? Is there a section of a bookstore that best reflects your work? Who knows your school's culture the best? What is happening at your school that nobody is talking about? What behaviors do you need to start, stop, and keep doing? Who is entitled to ask questions about "the way we do things around here"? Are staff trained in how (and how not) to ask questions? Which survey items do teachers own? Which survey items do principals own? Which survey items need money or additional resources to be improved? Are any of the survey items of particular importance to your school? Which items should your school not address first? Which individuals at your school will resist change? What are they protecting? Who do you trust outside of the school family to provide you with good information? How do you know what is true given multiple sources of data? When do you notice your school's culture the most? Do some instruments provide a peek into the future? Explain. Should you settle for the status quo? What happens five years from now if you do nothing to rewire your school culture? Chapter 8. The Beat Goes On–or Does It? What causes you to be at your best? When are you at your best? Why would a culture be likelier to preserve the past than to embrace the future? What is your school really good at and how did it get that way? Who or what is the enemy of your school? Chapter 9. How Long Does It Take to Rewire a Culture? What rewards exist to support negativity at your school? What would the first step toward rewiring your school culture look like? Are there people at your school who are trying to take a first step toward any change? Is the tool you need to improve your school already in your pocket? What past breakthroughs helped you build your current culture? What is not a breakthrough, but may feel like one? What went well today or this week that we can build on tomorrow? What if leaders knew what teachers wanted or needed before the teachers did? What cultural leverage points are you aware of in our school? Are there specific events during your school year that make for unique leverage points? What new events might you create to serve as leverage points? Could you arrange all school events into a prioritized list, revealing which are most sacred? Can you let the various layers of culture (subcultures) take the lead when a problem suits a subculture's strength? Are there "teams" at your school ready to play defense and one to play offense? Who might expect to be on the rewiring team, but won't be? Who might not expect to be on the rewiring team, but will be asked to be? How can you tell if the wrong person is serving on the rewiring team? At your school, what needs to be said publicly and what needs to be said privately? What is the texture of leadership like at your school? How are mistakes addressed in good school cultures versus poor school cultures? How does the principal influence the culture? How might the principal influence the culture? How might anyone influence the school culture? 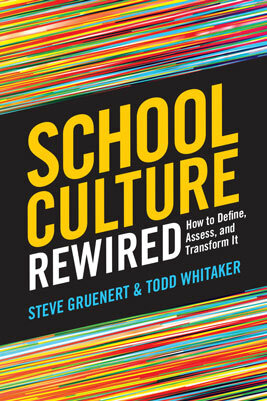 School Culture Rewired: How to Define, Assess, and Transform It was written by Steve Gruenert and Todd Whitaker. This 177-page, 6" x 9" book (Stock #115004; ISBN-13: 978-1-4166-1990-1) is available from ASCD for $19.95 (ASCD member) or $26.95 (nonmember). Copyright © 2015 by ASCD. To order a copy, call ASCD at 1-800-933-2723 (in Virginia 1-703-578-9600) and press 2 for the Service Center. Or buy the book from ASCD's Online Store. Copyright © 2015 by ASCD. All rights reserved. No part of this publication—including the drawings, graphs, illustrations, or chapters, except for brief quotations in critical reviews or articles—may be reproduced or transmitted in any form or by any means, electronic or mechanical, including photocopy, recording, or any information storage and retrieval system, without permission from ASCD.